This is my first homemade soaker project. It is a copper homemade, built for a school project, (I actually get an A-Level qualification for it!). It has 22mm OD (20mm ID) pipe from the pressure chamber up to the hose nozzle (can be unscrewed for a riot blast), and 15mm OD (13mm ID) pipe for the rest. The 5 litre expansion tank (the big white thing) has a rubber membrane which separates the air and water, and allows for a precharge which won't get wasted at the end of a shot. In theory this pressure chamber should be able to handle over 8bar (116psi), although I may struggle to reach 7bar (100psi) with the hand pump. The large brass fitting behind the nozzle is the laminator (made using similar techniques preciously shown by JLspacemarine on this forum). It uses a 20L backpack reservoir (also derived from sscentral). I can currently (but have not as yet) use it without a pump (which I haven't got round to finishing), by pressurising the PC through the hose nozzle. I eventually want a wooden handgrip/stock in the centre, with a bike cable operated trigger. I am however struggling a bit with the pump itself. I have read the articles on constructing a pump, but am unsure whether to use a hardwood or softwood (pine) wooden dowel, as well as what diameter to use based on my 13mm internal diameter pump housing. I can get 12mm or 9mm diameter wooden dowel. The 12mm would seem the better fit, but I am worried about how much it might expand (hence the softwood/hardwood question), whereas the 9mm might be too narrow, and I might not be able to find o-rings large enough to fill the gap. I don't really want to file down the diameter of a larger dowel over its entire length, as I doubt that I can do it accurately! Any suggestions for the pump material/size would be appreciated! Last edited by Andrew on Fri Sep 30, 2011 4:30 pm, edited 1 time in total. I have a question though - Why is there such a long vertical piece between the pump and the trigger? Surely you don't need that much space for a handgrip? I was planning on making a wooden stock/grip/trigger mechanism housing (as per 2nd thumbnail), but was unsure of how much room I would need. I needed to solder the elbows so I could get it working asap, so I cut that piece too long, and will reduce it later (when I know how big I want to make the wooden grip/trigger area). The problem is I don't think I can sand it accurately enough along the whole length of the dowel, and it will jam in the reducer fitting. Unfortunately I don't have a lathe, but it is possible that the engineering dept. has one small enough (from what I saw they were mainly larger ones, for larger metal components). If a particular type of wood (hard or soft) and hence diameter (based on hardness of wood and difference in expansion) would be better I would prefer to find out before buying and making a costly mistake. The hardwood especially is not cheap, but the softwood may not be up to the job (I believe softwood absorbs more moisture than hardwood, and so expands more, but I'm not 100% on that). If not I may well take your advice and go with the 12mm and be prepared to sand, so thanks for the suggestion. I admit it would be worse to find the dowel I bought was too small, than if it was too large. That sounds interesting, I'll have to look into that. Although for it to seal the o-ring, the wood has to expand slightly (if following Ben's method halfway down the APH construction page), so perhaps applying this process after the wood has expanded a bit, thereby locking in the moisture already in the wood, but preventing any more from being absorbed? Last edited by Andrew on Mon Oct 03, 2011 3:44 pm, edited 1 time in total. Oh wow. Looks heavy, but should be powerful. I hope you get a good grade. 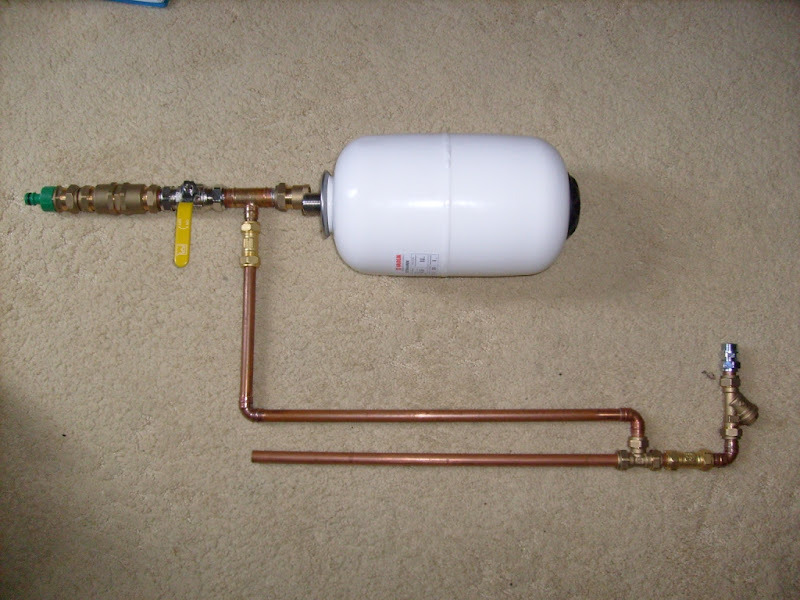 Could you use a metal or plastic rod for the pump? If you can get one that's a good fit that will probably be more durable than a dowel. I've got some acrylic rod, but I'm afraid it may be too brittle. The last thing I want is half the pump rod permanently stuck inside the pump housing! Metal or PVC rod might be a possibility, if I can find sources with reasonable prices. Nice! Glad to see some linear designs popping up, as well as some copper ones. I'm guessing the valve is opened in the picture? And closed is with the handle forward? This is a sort of awkward to use. I find that up closed, forward open works well enough to eliminate the need for a trigger. Also, if you are a righty, you may also want the handle on the other side. If you do want a trigger, JLSpaceMarine's CAR and Drenchenator's DR-4 prototype are good examples of triggers. I was thinking of a rotary trigger, along the lines of the DR-4, except with a bicycle gear cable instead of a metal bar to open the ball valve (very easy to alter its position, thereby altering the force on the ball valve lever arm, over its full motion). Tthe ease of altering the position makes it easy to get bumped and screwed up too. I admit, I haven't come up with a way of mounting it yet, other than really badly with cable ties. Just tested it by pressurising it through the nozzle with mains water (about 4bar / 58psi at a guess?:confused . It managed about 40ft with the 8.5mm nozzle, with a shot time of around 1.5s. Although, the riot blast (20mm nozzle) only got around 10 feet. Should go a bit further at 7bar/100psi, and if I drill out, or file out, the expansion tank holes (it has 4 small 5mm holes arranged in a square, restricting flow a bit). Will try some smaller nozzles made from drilled end-caps as well. A few leaks around the screw-on fittings, so more PTFE tape needed there. Will try to get accurate measurements (and shot pics) in the near future. Tested and measured today, after reducing precharge from 3.5bar to 2.5bar. Could the performance increase be because of more water volume in the PC (when it's nearly empty the diaphragm restricts flow)? Mains water pressure varies, maybe it was higher today, so I had more power? My early measurements were complete guesses I suppose. This time I did actually measure them. Lamination isn't too bad either, but there are still a few leaks around the compression joints, and I fear the laminator is restricting the riot blast a bit. I got the hardwood dowel (12mm) for the pump, and will see how it goes. If it fails horribly, maybe the PVC would be the way forward. Will try to get pics/vids (.flv?) as well as a power/output rating, whilst fiddling with precharge pressure to balance shot time and range. Last edited by Andrew on Sun Oct 02, 2011 6:15 pm, edited 1 time in total. That is nice! Try 30° for maximum range, 45° is less than optimal due to drag. The shot pressure is always going to be roughly the same with city water, methinks. Nice job! I'll try it at 30°, and see if I can get any more range out of it. As I said before, I'll try different nozzle sizes too; possibly a 1/2 inch or 13mm nozzle, and a couple of smaller ones. See if that helps range.